ALBANY, New York, July 7, 2011 (ENS) – New York Governor Andrew Cuomo is leaning toward removing a de facto statewide ban on natural gas development using hydraulic fracturing, or fracking, arousing the opposition of many New Yorkers and environmental groups. In response to new fracking proposals by the Cuomo government, a coalition of 47 consumer, faith, food, environmental and multi-issue advocacy organizations today called for a statewide ban on fracking in a letter they presented to the Governor’s Office. The coalition includes national and state organizations such as Food & Water Watch, Frack Action, Democracy for America, Friends of the Earth, Credo Action, Center for Heath Environment and Justice, Catskill Mountainkeeper and Citizen Action New York. Fracking involves injecting a fluid into shale rock to increase the extraction rate and recovery of oil and natural gas. An estimated 90 percent of the natural gas wells in the United States use fracking to produce gas. Environmental and human health concerns associated with fracking include the contamination of ground water, risks to air quality, the migration of gases and hydraulic fracturing chemicals to the surface, and the potential mishandling of waste. The governor’s position follows the release July 1 of the New York Department of Environmental Conservation’s recommendations on fracking, which allow the practice in most areas of the state outside of the New York City and Syracuse watersheds. Approximately 85 percent of the Marcellus Shale in New York would be accessible to natural gas extraction under these recommendations, said the DEC. Under the DEC’s plan, the coalition warns, thousands of new wells will be drilled across New York, using billions of gallons of fresh water, and industrializing rural communities across the state. “Has Governor Cuomo been hoodwinked by industry into thinking this is safe? The fact remains that New York needs to have some serious fundamental questions answered about the dangers of hydro-fracturing, not just carve out some special places to placate New York City,” said Wes Gillingham, program director, Catskill Mountainkeeper. 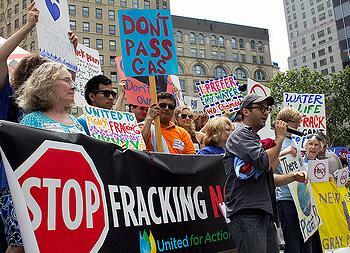 The opposition to fracking heats up in New York as other states have passed legislation banning the practice. Last week, the New Jersey State legislature sent Governor Chris Christie a bill that would ban fracking in the state, and North Carolina Governor Bev Perdue recently vetoed a bill that would have allowed fracking. To date, more than 60 municipalities in the United States have passed measures against fracking. The groups cite a recent investigative series by the “New York Times” that found the natural gas industry has exaggerated the economic benefits of fracking, while downplaying its risks to public health and the environment.